Verity Platt, Michael Squire (ed. ), The Frame in Classical Art: A Cultural History. Cambridge; New York: Cambridge University Press, 2017. Pp. xxxviii, 697; 221 b/w figs. ISBN 9781107162365. $135.00. ISBN 9781316677155. ebook. The volume is organized into five parts. The first, 'Framing the Frame', consists of a long, dense and extremely stimulating contribution by the editors, synthetizing and developing the work of the entire group of authors. Four more parts follow, analysing (and framing) different fields: Pictorial Space, Bodies, the Sacred, and, finally, Texts. The first paper, 'Framing the visual in Greek and Roman antiquity: an introduction', reflects on the core of the volume. Platt and Squire set forth the most interesting results and methodological innovations of the book in a clear and convincing way. The first question is 'what do frames do?' 'Frame' is not only bidimensional but, generally speaking, everything that 'closes' a figural unity such as architectural mouldings, statue bases or even the frameworks of wooden armature inside chryselephantine statues. On the other hand, the concept can be used also in a figurative sense, enlarging its meaning in many directions. The answer is articulated into seven subheadings. The first is 'The Frames of taxonomy', consisting of the traditional archaeological approach considering chronology and typology as a frame for looking at art. The second is 'Delineating the visual field', that is, the function of separating 'field from ground, establishing the confines in which an image is understood to operate'. A third subheading is 'Categorising space', which considers the function of differentiating between complementary sorts of signification, representational registers, narrative or symbolic fields, delimiting semantic zones for seeing and reading, for visual and verbal significance. The fourth is 'Ideologies of Signification': here the frame materialises cultural modes of structuring visual experience, in other words 'different framing practices function as reification of different scopic regimes'. The critique is against Kant, who defines the picture-frame as excluding 'all that surrounds it from the work of art, and thus also the viewer as well, and thereby helps to place it at that distance from which it alone is aesthetically enjoyable' (p. 42, cf. 57-58). The fifth subheading is 'Ill-detachable detachments': the Derridean definition means that frames do not just articulate boundaries, they negotiate them, operating as porous membranes rather than impassable frontiers, offering a liminal zone between the image and its world, a space for experimentation, transgression and excess. The frame permits the images to function as such rather than as the 'thing itself'. The sixth, 'The Self-aware Frame' highlights the self-effacing qualities of the frame and its deictic function. The painted frames of the pinakes in the frescoes of the Villa della Farnesina in Rome effect a 'pictorial split' (Stoichita) between painting and ground, introducing a meta-pictorial comment on the frame's function as an 'ontological cut' between the painted wall and the 'paintings' within it. It is the frame of the frame or Superframe (Stoichita). The images have a power deriving 'from the illusion that the viewer can either enter the frame…or else that the image itself can burst out of its confines and engage directly with its beholders' (71). Some observations are here necessary: the authors seem to attribute the Theory of Enunciation to Derrida and Marin (or Stoichita), but this approach has deeper roots in linguistics (Benveniste and Jakobson) and in Greimasian semiotics. This theory allows us to reformulate and develop the last point, that of the Superframe: it is the so-called referentialisation2, in other words putting a painting in a painting—a fictionality at the second degree—is equivalent to declaring the fictionality of the paintings in the second level in order to reinforce the impression of the reality of the first one. Sometimes this power is further reinforced and doubled by the inscription addressing directly the beholder in the second person, or, vice versa, suggesting that the beholder address the image.3 The last, 'Framing context' analyses the performative work that frames act out. Formal frames are nested within larger organisational modes. For example, 'the Villa della Farnesina cubiculum simulates acts of reframing that are functional to appropriative patterns of imperial translation, replication and adaptation'. According to Platt and Squire one of the functions of the frames is meta- communicative, but we could reformulate this claim in a more radical way, because the function of the frame is essentially metalinguistic: it is a typical enunciational device. We arrive now at the final and perhaps most intriguing question: Where does the frame stop? (p. 84, cf. Trimble, p. 320 n. 5) The answer remains open and the authors quote Lebensztejn4: 'The power of the frame is to a large extent linked to our inability to answer this question, as well as to its invisibility and the continuous transition from the physical to the metaphoric or symbolic.' This point deserves our comment: to be sure the issue of the unlimited reframing is not very far from the similar question of the 'unlimited semiosis' in the Peircian system. To avoid the risk of an unlimited regression we could recall that Umberto Eco proposed an answer reinterpreting Peirce's pragmaticism: 'after having received a series of signs and having variously interpreted them, our way of acting within the world is either transitorily or permanently changed. This new attitude, this pragmatic issue, is the final interpretant', or a habit, even if 'this stopping is not final in a chronological sense, since our daily life is interwoven with those habit mutations'.5 A last section of the paper, 'Escaping Criticism', has some connections with the last question: if the framing is unlimited, then how it is possible to frame the book, or limit it through the choice of survey paths and subjects? In the attempt to prevent criticism for these choices, the editors make no apology for the selectiveness in the case studies; on the other hand, they invite others to 'leap into (their) frame…and push against its necessary boundaries' (p. 97), with all the positive consequences (and the risks) that this approach entails. In response to this invitation, at least a couple of topics come to our mind: topography and time. We could consider the precinct of a sanctuary or the pomerium of the Roman city as important frames. The same deed—burying a deceased, bringing weapons—has a completely different meaning outside or inside the limits of the city. Furthermore, there are not only spatial frames, but also temporal ones: the calendar is an endless frame encapsulating like a nest of Chinese boxes the social time. In a quick and incomplete way we will touch on the remaining sections of the volume. Part II is devoted to 'Framing pictorial space' and tackles the question of the images staying within boundaries, overlapping or overlapped by them (Clemente Marconi, cf. also IV.8. Milette Gaifman). Guy Hedreen addresses a crucial point: the issue of the en face figure, arguably amounting to an all-out assault on the frame. An interesting question is that of the face of Medusa: the gorgoneion threatens to frame the viewer. The question is: why articulate a monstrous power only in order to defeat it? We could suggest an explanation: the image on the vase mimetically reflects reality like Perseus' mirroring shield. In other words, the painted image allows us to observe the reality in an indirect, protected, and less dangerous way. Finally, Michael Squire devotes his paper to Campanian wall painting: the image of rooster pecking at grapes complete with a painted curtain illusionistically draped over the scene collapses the different representational levels, blurring the margin between the image and the beholder and offering another example of the above-mentioned referentialisation, or reality effect. Part III, 'Framing Bodies', deals with sculpture: is an inscription carved on an archaic Greek statue an abstract ornament or a meaningful text (Nikolaus Dietrich)? 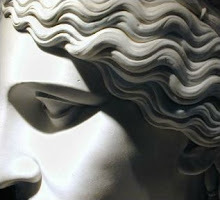 How does frame affect social identity in Roman portrait statues? It depends on the focus of our interest: whether we consider the face, the hair, the body, the base, the surrounding architecture and space, or the broader social and cultural situation (Jennifer Trimble). Are the tomb and the sarcophagus a frame, a boundary to cross when the living and dead try to communicate (Verity Platt)? Part IV, 'Framing the Sacred', analyses the implications of the frame in a sacred domain. Particularly interesting is the paper by Robin Osborne, illustrating the force of an absence: the Attalid group of the Small Gauls on the Acropolis of Athens deprives the beholder of the distancing effect of the frame, engaging him in a direct involvement, in semiotic terms another form of embrayage (engagement).6 The archaizing style is a frame too, a signal of numinous potency, visually differentiating the levels of the human and divine presence, expressed through the use of non- or pre-naturalistic images (Jas' Elsner): the style as metalinguistic marker. Part V, 'Framing texts', examines the dissolutions of the boundary between frame and framed, text and image in Optatianus' technopaignia (games of poetic and pictorial skill) and carmina cancellata (gridded poems) (Michael Squire); the function of the illustrations in technical texts (Courtney Roby); and the evolution of shape and meaning of the epigraphical frame between the Classical age and Late Antiquity (Sean V. Leatherbury). The last paper by Rebecca Zorach frames 'antiquity' from the point of view of an art historian specialised in early modern art. Summing up, the volume is of extraordinary interest, tackling a subject transversal to several fields, examining from a different point of view and with new eyes old problems or thematising apparently trivial issues in order to demonstrate just how fundamental they are. We could propose that a further step for widening the frame of this approach could be a more systematic and conscious use of semiotic tools and particularly of the Theory of Enunciation, which until now seems to have not yet penetrated into the English-speaking academy, where all the contributors—with one exception—are from. Among the issues to explore from this perspective, we could consider the pragmatics of the frame, because as an enunciational device it embodies the vantage point of the viewer, so that a frame in the mosaic pavement, for instance, is completely different from a frame on the wall. Walking on the mosaic, the beholder enters the frame, is 'captured' (or protected): we could recall the mosaics with labyrinths, city-walls, or even Solomon's knot on the threshold for capturing the evil eye. On the contrary, on the wall the frame is often intended as a window (as explicitly theorized by Leon Battista Alberti) and (at least theoretically) the viewer could cross the window and enter the painting or the landscape (like Hermann Hesse in the final scene of his fictional autobiography). 13. Envoi: framing 'antiquity', Rebecca Zorach. 1. Leaving aside other suggestions, the name evokes the Neoformalist film analysis inspired by the Russian formalists and reacting against Althusserian structuralism and Lacan's psychoanalytic semiotics, but probably this suggestion goes too far and nothing among the theoretical positions of the various essays recalls this approach in a specific way. 2. A. J. Greimas and J. Courtés, Semiotics and Language: An Analytical Dictionary, Bloomington (IN) 1983, 88-9, Disengagement (Débrayage) n. 4. 3. P. Liverani, "Chi parla a chi? Epigrafia monumentale e immagine pubblica in epoca tardoantica", in S. Birk, T.M. Kristensen and B. Poulsen (edd. ), Using Images in Late Antiquity, Oxford; Philadelphia 2014, 3-32. 4. J.C. Lebensztejn, "Starting out from the frame (vignettes)", in P. Brunette and D. Wills (eds. ), Deconstruction and the Visual Arts, Cambridge 1994, 118. 5. U. Eco, "Peirce's Notion of Interpretant", MLN 91.6 (1976), 1465; Id., The Role of the Reader. Explorations in the Semiotics of Texts, Bloomington 1984, 193-4. Cf. also Id., The Limits of Interpretation, Bloomington and Indianapolis 1994, 39.